To many, the joy of turning 21 opens a new door to where one can legally drink alcohol. No longer are they condemned to spend their nights hunting for of-age people willing to purchase them alcohol, nor are they required to concoct ingenious schemes to sneak alcohol into dorms. ASHLEY NGUYEN TTN Hipsters and working class crowds come together at all times of the day to enjoy a relaxed atmosphere at Oscar’s. However, many of these options do not differ entirely from the experiences previously enjoyed in the underclassmen days. Places such as Lucy’s Hat Shop and McFadden’s create fraternity-party atmospheres, yet overpriced domestics have some people regretting more than just their hangover. To some, this is acceptable; To others, enjoyable; Yet to several, a new institution is demanded. Here enters Oscar’s Tavern. Located in Rittenhouse Square on 15th and Sansom streets, Oscar’s exists for a different crowd. Here, an interesting equilibrium of hipsters and actual blue-collar workers refresh together. Unlike many other bars frequented by students, seating is in demand by patrons at Oscar’s, leading to crammed booths and tables. This may be daunting, it may force multiple parties into the same booth – and yet for others, this is a reason alone to go. It gives many the opportunity to meet different people who are often eager to converse. Although Oscar’s can be a loud, it rarely surpasses an unacceptable volume for conversation. Oscar’s, if anything, is a dive bar. It has no happy hour or specials – the beer is cheap enough. Unlike many other dive bars though, Oscar’s never creates an unwelcoming atmosphere, and the bathrooms are awkwardly clean. Pass Scott, the man in the Grateful Dead shirt, is the doorman. Normally, this job means a quick ID check before letting more in to the bar, but Scott is more than happy to discuss hometowns and drinks. Some snap a quick picture with him or offer him a cigarette. After bypassing Scott, you’re in. There’s a jukebox filled with Billy Joel, Elton John, Michael Jackson and the Rolling Stones. If there’s no seating, ask to join a table. They shouldn’t deny you a spot. “Why enter the hornet’s nest when you’re at a place with drinks,” Scott asked. These wise words were part of Scott’s explanation for sitting down to talk to me – it was this or go home to his angry girlfriend. Sunday is one of the few days to meet with Scott and talk. He runs the door Wednesday through Saturday, and in his free time on Sundays, he returns to his workplace to enjoy some Budweiser. Although Scott has only been working security for a little more than a year, his knowledge of Oscar’s regulars is uncanny. This is because Oscar’s has been a large part of his life. He has been frequenting Oscar’s since 1982. Aside from the cheap beer and the casual atmosphere, he is a regular at Oscar’s. After many years working an odd combination of jobs, including construction and bar work and at Banana Republic, Scott finally left his barback job at the Level Room to help out at Oscar’s. However, even though bar jobs have made up the majority of Scott’s careers, he said his true interest lies elsewhere. Yes, bars provide food and drink and the ever-tempting liquid meals, but Scott said his true love is the Grateful Dead. To Scott, Oscar’s is a fantastic arena to meet people who just want to sit down and talk. Of course, in any place where large amounts of alcohol are involved, things may get rough. 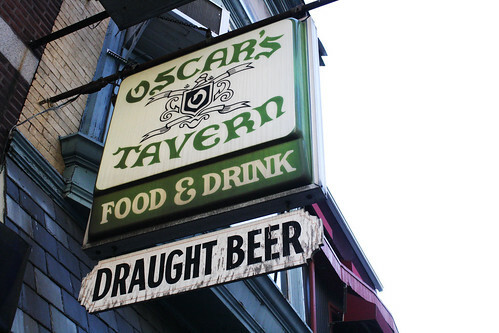 One hidden gem of Oscar’s is that, as the name tells us, it is a tavern. A tavern gives the image of Robin Hood and times of old, but really, it means the bar has food, actual food. If anyone visits during the week before 10 p.m., the place is vacant. This bar exists for heavy drinking and nothing more. Sit in Oscar’s for lunch and order a cheesesteak and a Yuengling. The food is nothing to send postcard home to, but at least day drinking is appropriate and acceptable at Oscar’s, with many doing so during their much needed lunch break.